Gone are the tinkerers who used to buy sets. Music with one dial whirl is wanted today. 1930’s sets will carry one dial or automatic tuning to be up to date. THE new 1930 radio sets will be first of all. beautiful. The most marked change in trend in winter buying of radio sets, according to a large number of radio dealers, is that the emphasis has changed from interest in a radio set as a piece of machinery, to demand that it be a piece of furniture. In the past, most radios have been sold because the buyer wished to get things over the air. This condition still exists, but coupled with it is the fact that the buyer now also wants his radio to be handsome as well as practical. 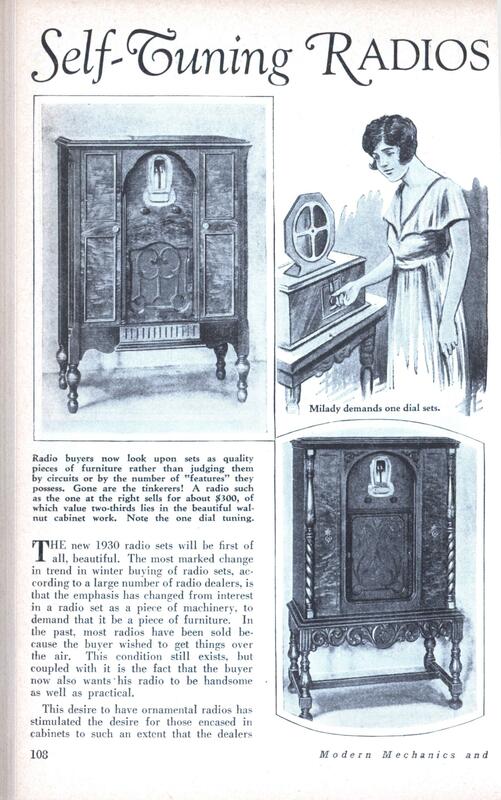 This desire to have ornamental radios has stimulated the desire for those encased in cabinets to such an extent that the dealers now advertise and sell the so-called console sets to a greater extent than ever before and claim that before long nearly all the sets sold will be of this type. The women in the families are responsible for this trend, largely. Formerly the man in the family bought the radio set, and did not mind its looks. 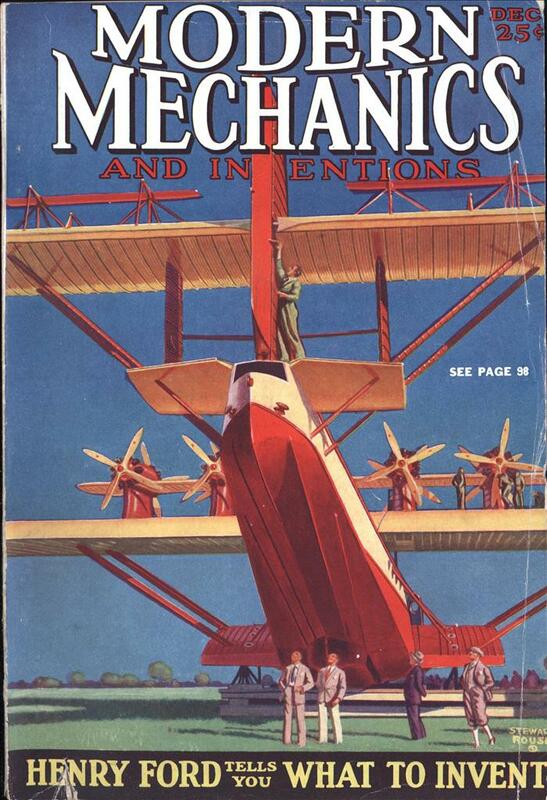 Also, he might be mechanically minded and liked to tinker with his machine, making all sorts of adjustments himself. But his wife, with less mechanical interest, wanted a set which she could turn on, set at a certain spot and listen to. This of course has simplified the mechanical parts of radio sets. Practically all the 1930 models are one dial sets, with a minimum of dial turning to get the desired station. The old tinkerer, or radio enthusiast, has not entirely passed away, but he usually has two machines now, dealers say. He keeps his old machine, to play with, adjust, take to pieces and put together again. But he also has another one, or is buying one this winter, which won’t get out of order, and which he can turn on and forget about. Another growing development in next year’s radio sets is the all electric set, the one which can be plugged into a wall socket. The old fashioned battery set is almost passing out of existence, in the cities and towns which have electricity. Manufacturers are still making a few of them, for use on the farms and in the villages where electricity is not used in the homes, but in the larger cities and towns a battery set can hardly be sold. In a survey made recently among nearly four hundred radio dealers in the middle west, all reported that they sold over 99% all electric sets. Given that the image shows three variable capacitors connected to the one tuning dial, and those separated from one another by some distance, I take it that the radios depicted are TRF (Tuned Radio Frequency) radios rather than modern superheterodyne radios. TRF receivers were cheaper to produce at that time. Until 1930 RCA pretty held the rights to Superhet tuning. By the mid 30’s, the superhetrodyne started to take over once the cost of production started to drop. $300 for a radio is not trivial even today! The inflation calculator gives the modern equivalent as nearly $4000. TRF receivers can actually work pretty good. Back in the early 60’s I used a Navy WW2 surplus TRF receiver with 3 RF stages and regenerative detector for shortwave listening. I understood at the time that it was used because there was no local oscillator that would radiate and attract the attention of any sub in the area. Forget the model number, but it weighed about 100 pounds with separate power supply. MikeBurdoo: Was it one of these perhaps? @ Stephen – You have to remember this was 1929, Radio was the equivelent of HDTV, and you remember how much those cost when they first came out? You have to pay to be an early adopter. John – Talk about a way-back machine! I’m pretty sure that what I had was the RAL-7 (CND-46156) with companion power supply. I didn’t have the manual to correlate dial readout with frequency. I just made a note of the Short wave broadcasting stations as I came across them. Heavier than heck (rock stable of course); it beat the daylights out of my Hallicrafters S-38. Many years later when I got my Ham ticket I used a Hammarlund Super Pro SX and that was a great receiver.